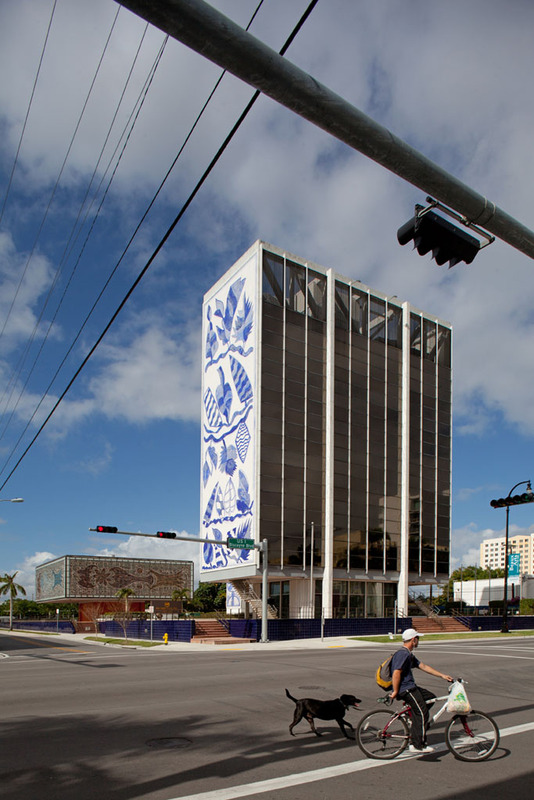 The Bacardi Building provides a striking example of Miami Modern (MiMo) hybridized with the International Style in Miami, Florida. Some combinations are just irresistible: Fred Astaire and Ginger Rogers, Lennon and McCartney, Simon and Garfunkel, Bacardi and Coke. 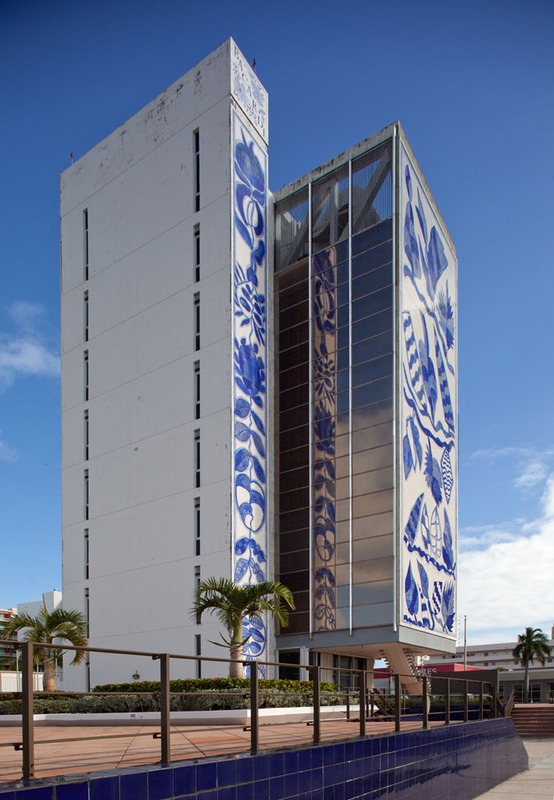 That such a relationship exists between two buildings may seem to be a little of a metaphorical stretch – that is, until you encounter the two superbly crafted buildings that make up the Bacardi building complex here in Miami. One building stands tall and proud, the other spans wide and colorful. If the Bacardi buildings were a song, they might be that famous Lennon and McCartney recording, "A Day in the Life" from the 1967 album Sgt. Pepper's Lonely Hearts Club Band. Lennon's more caustic lyrics rise in tone, defining the plaza of their music, and McCartney's optimistic retort playfully provides a backdrop. 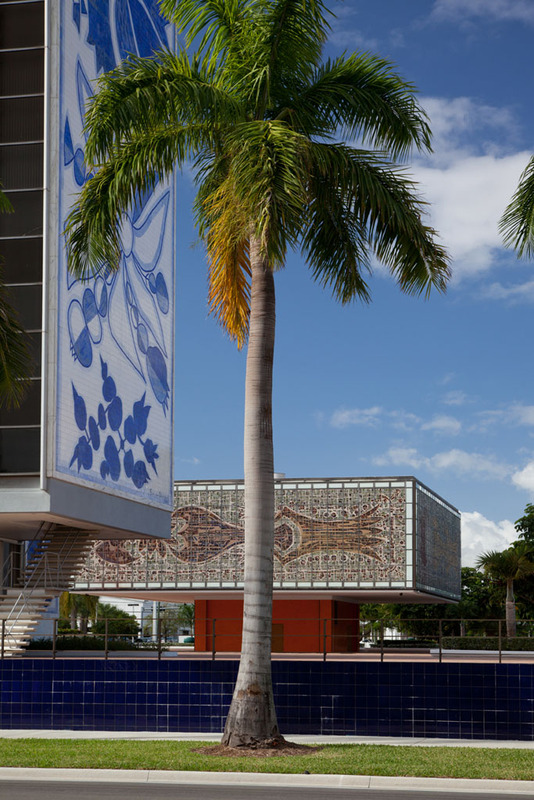 Bacardi's tower, designed by Enrique Guitierrez in 1964, rises cool and architecturally fecund from its concrete roots, and Bacardi's cube, designed by Ignacio Carrera-Justiz in 1973, dances atop a hopeful plinth behind the scenes. It’s a very graceful juxtaposition. To extend the metaphor, it is like the juxtaposition afforded by Lennon and McCartney in "A Day in the Life," in which the contrast is emphasized by the Royal Philharmonic Orchestra playing backward. 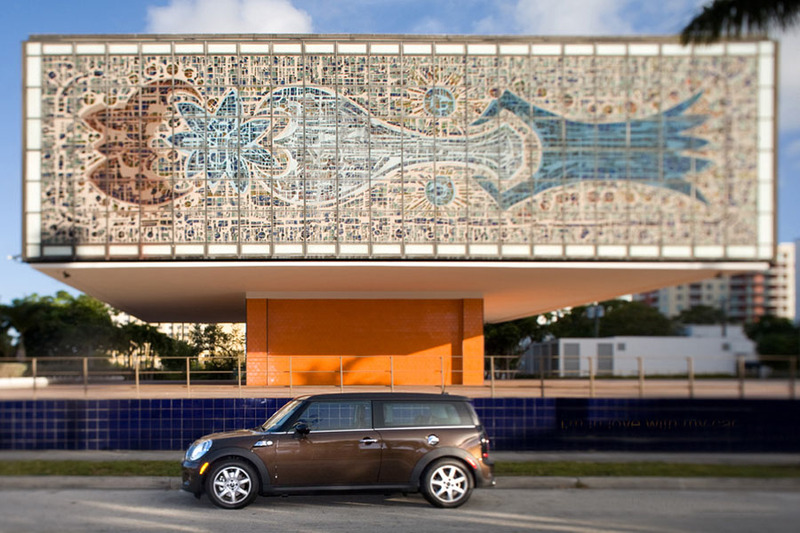 In the Bacardi complex, the work of Guitierrez and Carrera-Justiz is divided by Bacardi's corporate logo, the Bat. Stroll through the plaza and find yourself transported into a world of modernist sophistication, spatial clarity, and a cool urban rhythm that Vitruvius would have delighted in. 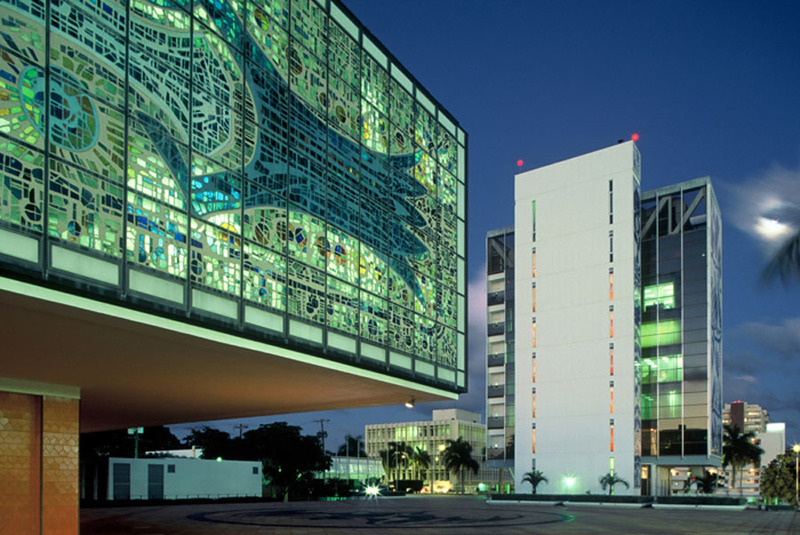 Ask architects in Miami which is their favorite building, and many, including Allan Shulman and Chad Oppenheim, will tell you that hands down the Bacardi building beats all others. 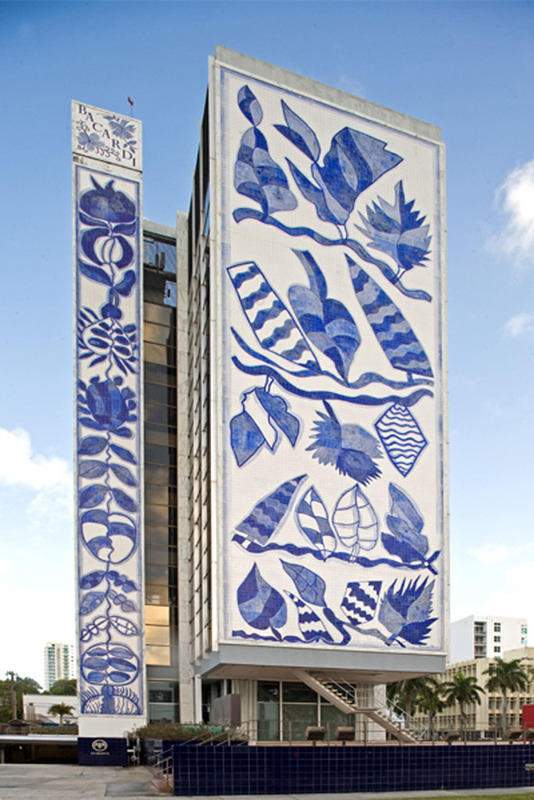 This is high praise indeed when one considers that Miami's architectural oeuvre includes instant icons such as Herzog and De Meuron's 1111 Lincoln Road, Frank Gehry's New World Center, and I.M. Pei's brilliant piece of corporate architecture now known as the Bank of America Tower. To further understand this unalloyed praise for the Bacardi building complex, I recently spent some time photographing these masterpieces from different points of view. 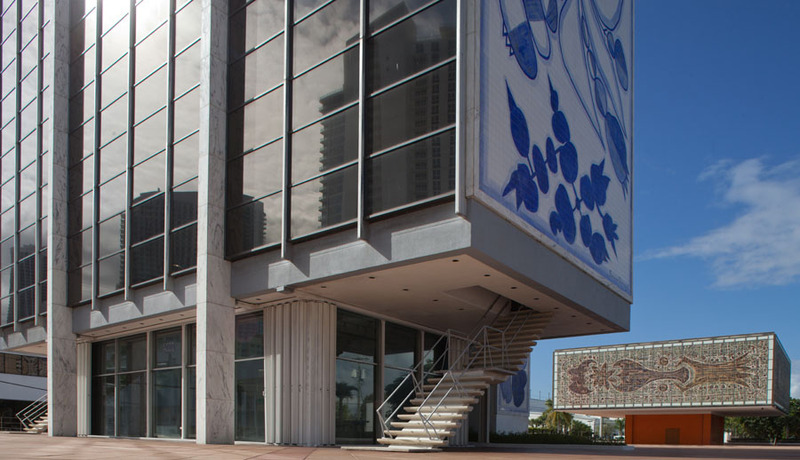 Set on its own plaza (much like the Seagram Building designed by Mies and Johnson), this 1964 masterpiece oozes tropical modern sophistication and International Style restraint, while at the same time exhibiting an intoxicating MiMo (MIami Modern) extravagance. 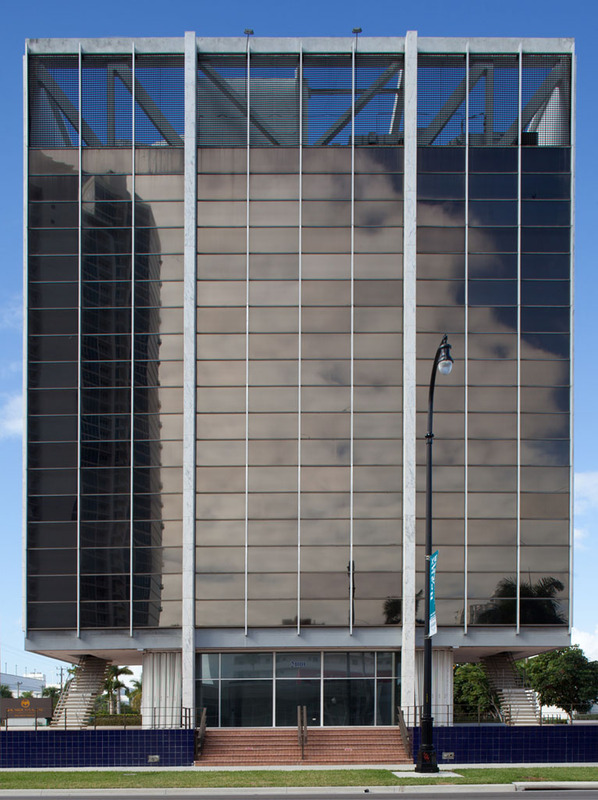 A sheer curtain wall of darkened glass faces east toward Miami's main thoroughfare, Biscayne Boulevard, appearing to contemplate the various goings-on from behind its mysterious facade. 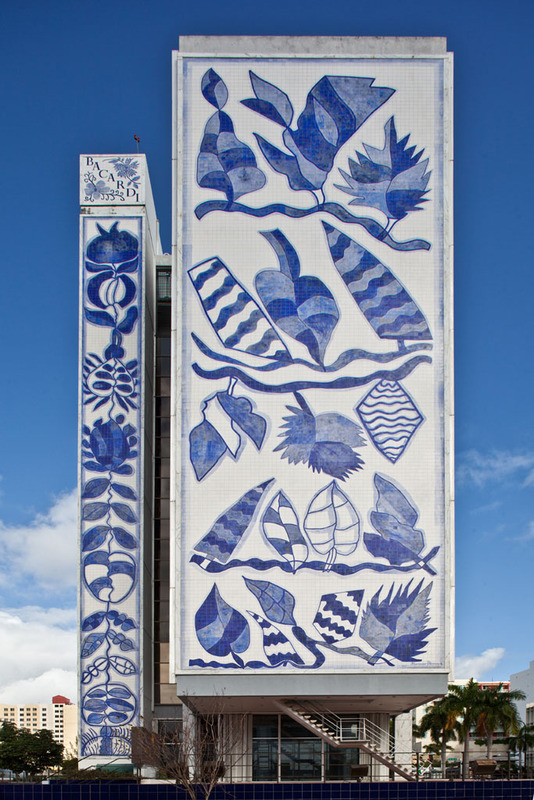 Turn the corner, though, and the sides of the building explode with the vibrant murals of Brazilian Francisco Brennand, which depict a series of tropical plants and animals concocted from 28,000 blue and white tiles. It’s a rich dichotomy full of Geminian counterplay. On the one hand, you can hear Mies Van Der Rohe whispering "Less is more," and on the other, you can hear Morris Lapidus exalting "Too much is never enough." One would have thought that these two extremes would not result in a congruous love affair of architectural styles, but the Bacardi building proves otherwise. It’s a stark but well scaled composition that allows both buildings to breathe and yet still allows a certain degree of spatial communication to flow between them. 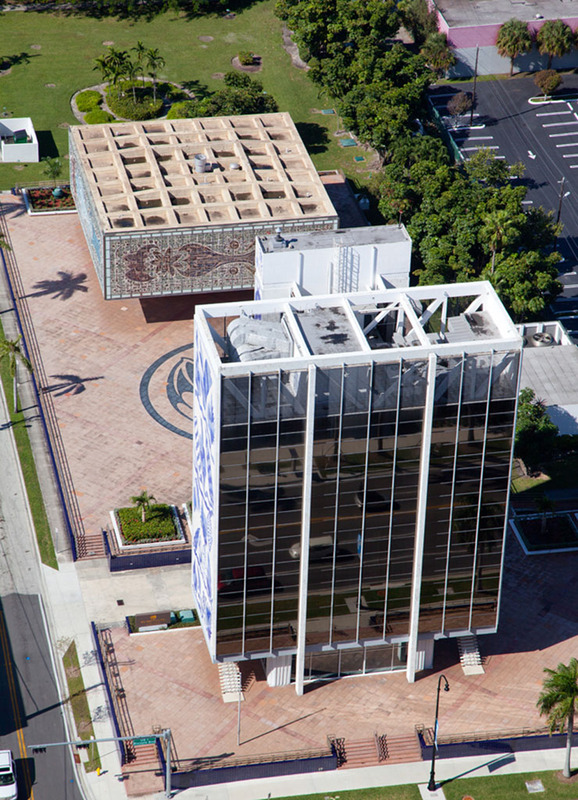 It is this conversation across space that gives the Bacardi building its special urban ambience. Despite all their collective architectural delights, however, these two enigmatic lovers face an uncertain future. 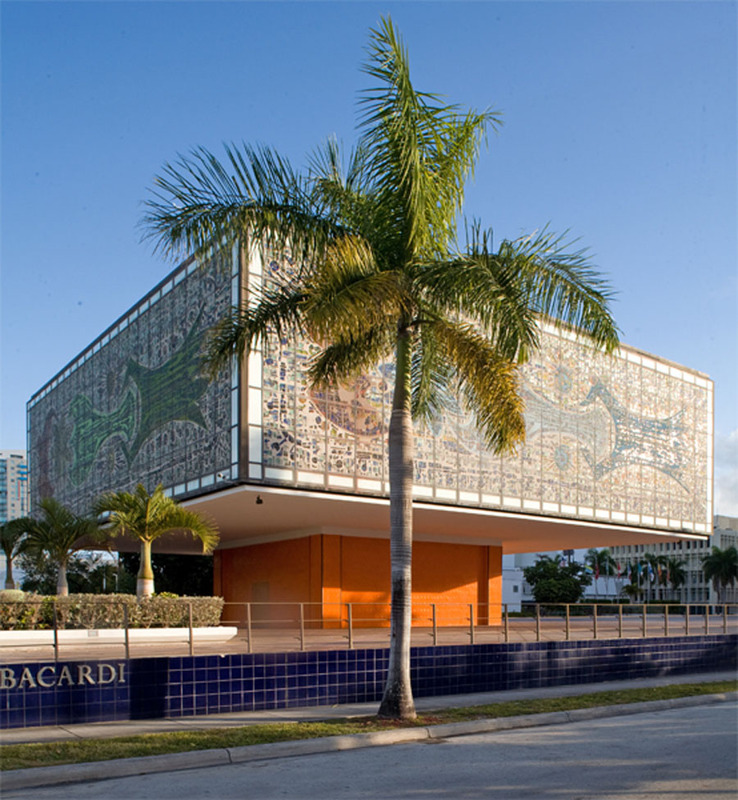 Bacardi USA vacated the building in 2009 and set up shop in a new corporate headquarters in Coral Gables. 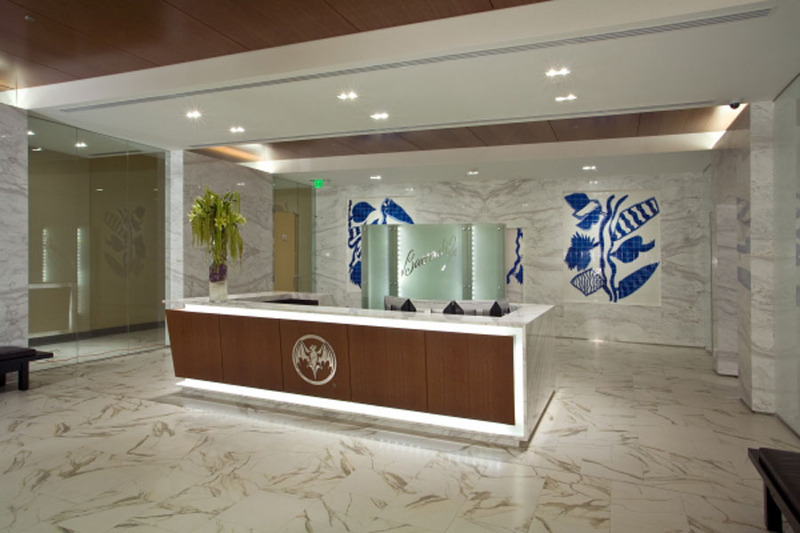 That building's lobby sportingly recreates the fabulous mural from the original building, a smart and creative gesture for sure, but a long way from historic preservation of the original. So what of historic preservation, that most understated and profound custodian of our cultural heritage? 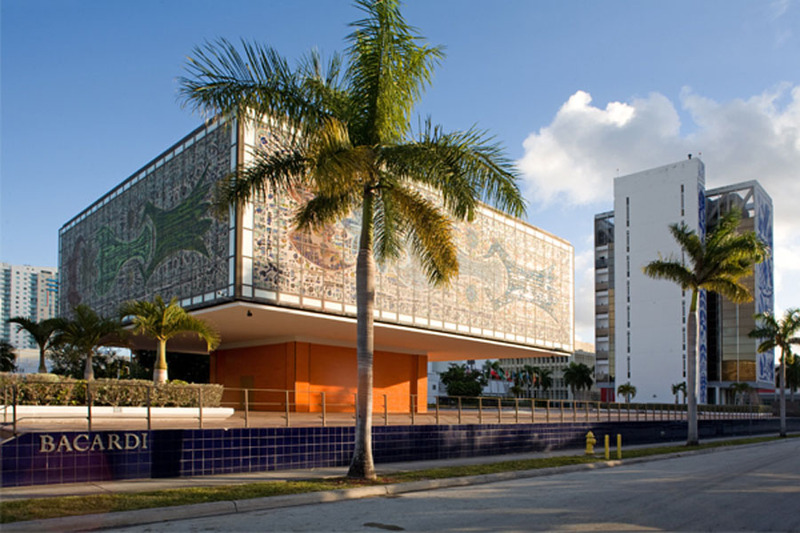 The Bacardi building is currently designated "historic" by the City of Miami (significantly, before the usual 50 years necessary to achieve that designation). The order protects both the buildings and the plaza that connects them. The historic designation prohibits changes in the buildings’ outward appearance and, just as importantly, allows for tax breaks and grants. This is good news indeed for lovers of cool modern architecture, but the buildings are currently unoccupied, making them aloof to the urbanity surrounding them and waiting for purpose. 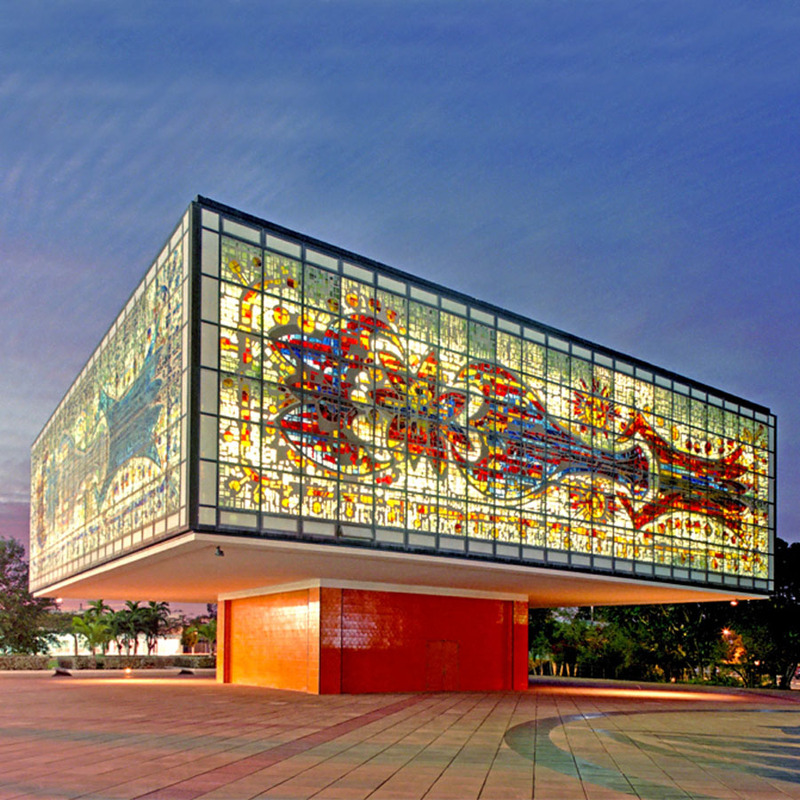 Could that purpose be a Museum of Modernism? 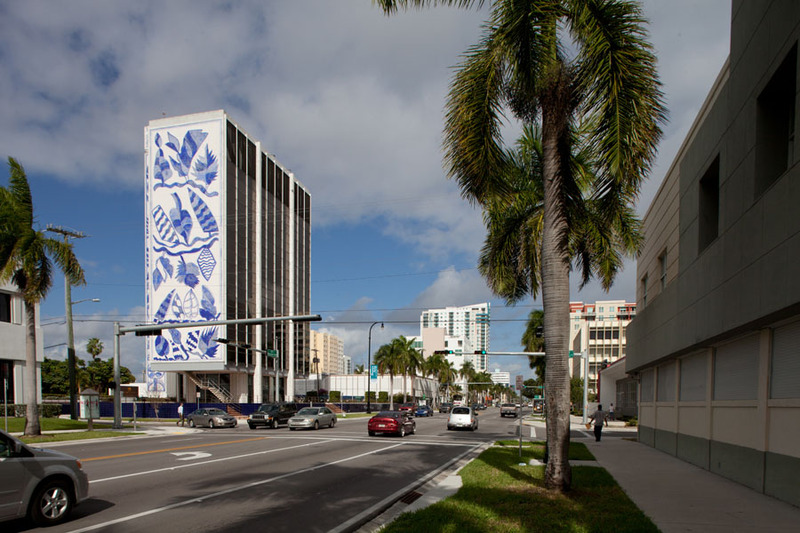 The buildings themselves are the perfect start for an iconic collection, and this leaves many people in Miami asking the question: "Who will step forward to fund this new creation? What combination of urban saviors can 'save' the Seagram of the South?"